(Nanowerk News) Before modern medical lab techniques became available, doctors diagnosed some diseases by smelling a patient's breath. Scientists have been working for years to develop analytical instruments that can mimic this sniff-and-diagnose ability. 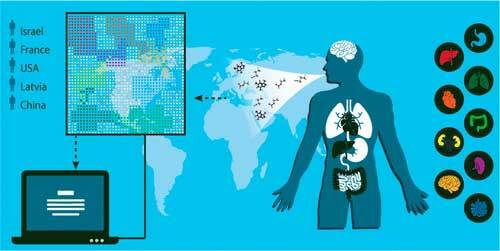 Now, researchers report in the journal ACS Nano ("Diagnosis and Classification of 17 Diseases from 1404 Subjects via Pattern Analysis of Exhaled Molecules") that they have identified a unique "breathprint" for each disease. Using this information, they have designed a device that screens breath samples to classify and diagnose several types of diseases. Exhaled breath contains nitrogen, carbon dioxide and oxygen, as well as a small amount of more than 100 other volatile chemical components. The relative amounts of these substances vary depending on the state of a person's health. As far back as around 400 B.C., Hippocrates told his students to "smell your patients' breath" to search for clues of diseases such as diabetes (which creates a sweet smell). In more recent times, several teams of scientists have developed experimental breath analyzers, but most of these instruments focus on a single type of disease, such as cancer. In their own work, Hossam Haick and a team of collaborators in 14 clinical departments worldwide wanted to create a breathalyzer that could distinguish among multiple diseases. The researchers developed an array of nanoscale sensors to detect the individual components in thousands of breath samples from patients who were either healthy or had one of 17 different diseases, such as kidney cancer or Parkinson's disease. By analyzing the results with artificial intelligence techniques, the team could use the array to classify and diagnose the conditions. The team used mass spectrometry to identify the breath components associated with the diseases. They found that each disease produces a unique volatile chemical breathprint, based on differing amounts of 13 components. They also showed that the presence of one disease would not prevent the detection of others - a prerequisite for developing a practical device to screen and diagnose various diseases in a noninvasive, inexpensive and portable manner.